is where the Lee Bay we were looking for is located! Fantastic Conch Cap photo, we love it! Thanks for sharing it with us! We are all very excited for the start of the new season beginning this month! You will notice a few changes this season. During September the Conch staff were very busy working to make sure your next Conch Charters experience is even better! All of our boats will now feature a 10′ Galaxy tablet! It will contain all of your boats information as well as useful tips and hints about cruising in the BVI! Quickly and easily find what you need, along with photos to help you understand your boat’s systems better! For those of you who don’t want to completely switch off our staff can help you set up a guest account so that you can also use it to browse the internet and check email. Many of our charter guests like to bring a cooler down containing a fewfood items but don’t want to take it home again! No problem! We are happy to buy the cooler from you (up to a value of $40) if you bring a NEW cooler. If you manage not to lose the receipt, bring it down with you! You can get this Coleman 48 quart marine cooler from Walmart for just $35.99! Marina Cay, a small 8 acre island located right next to both Great Camanoe and Scrub island, is only a stone’s throw from Tortola. In the early 90s, the island was brought by Charles Tobias, founder of Pussers, who set about building the small resort, gift shop and restaurant that is still there today! It had joined the chain of Pussers restaurants that are scattered throughout the BVI. Marina Cay is a popular overnight spot for many with around 30 overnight moorings all maintained by Moore Secure, there are consistent breezes which help to keep it cool in the evenings. It may be small but there is a lot packed into this little island! They have a fuel dock with both gas and diesel, plus water and ice available. The dock is home to the famous red phone box, which features a live webcam looking out over the water! Add a gummy spider to the bottom of a curved glass filled with ice. Next add the rum and a dash of lime juice. Then pour the ginger beer so that it floats on top. Finish with a wedge of lime! A great Halloween ‘twist’ on this Caribbean classic! In which bar was the Painkiller invented? All of us have a story from the time there was ‘one to many’ Painkillers! But in which bar in the BVI was it first created? Hint: It may be Pussers signature drink, but it wasn’t invented in one of their bars! This yacht has been dropped in price on 2 July 2015 for a quick sale…..Come with an offer! The cockpit has 360 degrees of visibility from the double helm seat and a hardtop bimini provides shade. In addition, the cockpit has walk-through access to the swim platforms, a full electronics package, stereo/CD player speakers, a large drop leaf table, and lots of seating. A wide door opens to the luxurious saloon. Brightly lit and well ventilated for maximum comfort, the saloon features a plush V-shaped settee and a large dining table that converts to a double berth. The adjacent galley has all amenities and plenty of Corian counter space. The yacht has four luxurious double staterooms with en suite heads and showers, and forward in each hull are single berths. There is ample storage space throughout. Shore power air-conditioning. 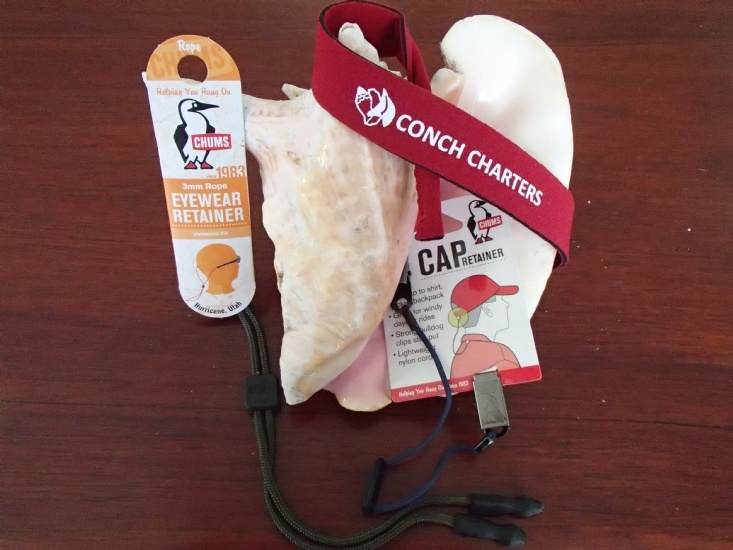 Send us you Conch Cap photos from around the world so that we can share them with others!